Tumble Dry Low or Hang Dry. Do Not Iron. Do Not Bleach. 2.The tags are on the outside of the garment to prevent friction. Let the baby be more comfortable. 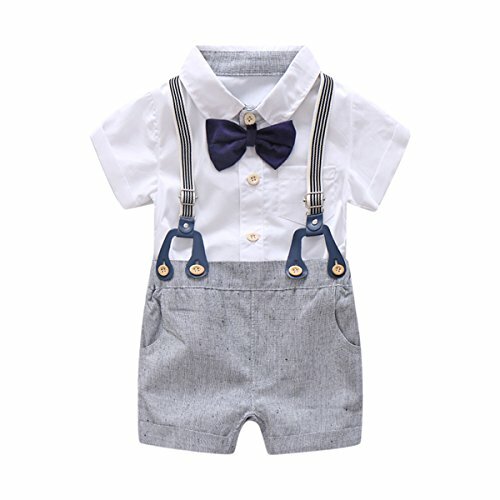 3.Includes : 1 white onesie ,1 short overalls,1 bowtie,1 suspender.Please contact customer service, if there is something missing in your package. 4.Suitable for many special occasions: birthday party, family celebrations, Wedding, Easter, Christening and daily wear etc. 5.Please note that Boarnseorl is the only genuine article. If you have any questions about this product by Boarnseorl, contact us by completing and submitting the form below. If you are looking for a specif part number, please include it with your message.